(S) Mens Vintage 70s Short Sleeve Disco Shirt! Coral w/ Burgundy Top Stitching! 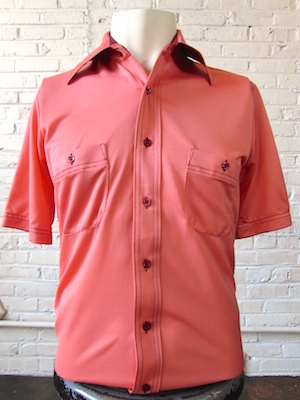 Home > Men's Vintage Shirts > All Men's Vintage Shirts > (S) Mens Vintage 70s Short Sleeve Disco Shirt! Coral w/ Burgundy Top Stitching! Mens vintage 1970's short sleeved polyester disco shirt! 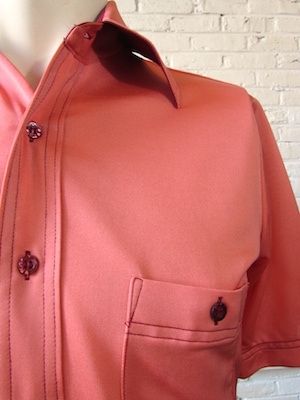 You will be discolicious in this bright coral shirt with burgundy top-stitching! Has a super wide and pointy disco era collar with burgundy trim on the interior of the neckline. Closes in the front with pearly burgundy buttons. Two chest pockets with button closures. Short sleeved with a straight hem. Tagged by Kmart. 100% polyester. Condition: Very Good. Has some light gray smudges on the upper left front side of shirt. Still a great shirt for your disco party!